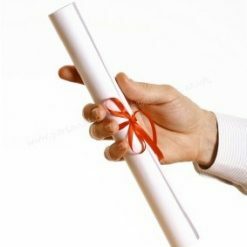 Certificate and diploma printed ribbons, say a special message with our certificate ribbons. Ideal for colleges, schools and workplace qualification ceremonies. These ribbons can be printed with your own personal messages and logos and can be pre-made to slide over your rolled certificates if required. Each printed ribbon for your certificates are printed and cut to the desired lengths professionally and arrive ready for you to use. You can also buy printed ribbon and cut yourself if you are working to a tight budget.